In new condition sealed in original box. 8 GB storage. Best Gift 2019. Plus, with an ultra-thin, high-transparent touchscreen, every image appears closer, clearer, and sharper. With 8GB ROM storage, the DX765 Pro/DX768 Pro has plenty of space for all of your important files, videos, photos, and presentations. Galaxy Tab 3 Lite (Tablet Only). Built-in 8GB Nand Flash and the TF card slot gives you the freedom to add more storage or transfer music and pictures. 9" Android 5.1 Tablet PC. CPU Quad Core @Up to 1.2GHz, ARM Cortex-A7. OS Android 5.1. USB Charging Cable. new USB Charging cable. 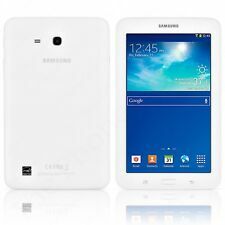 Samsung Galaxy Tab 4 Tablet SM-T230NU 8GB, Wi-Fi, 7in, White, Condition is used but like new. I bought a pair of these for my wife and I but she decided she wanted an iPad mini instead. She used it for a week and its been sitting in a drawer ever since. It has a screen protector installed. Absolutely great shape. Shipped with USPS Priority Mail. 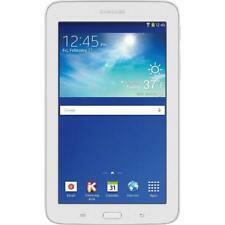 Samsung Galaxy Tab 2 SCH-I915 8GB,Verizon LTE, Wi-Fi 10.1in - Gray 2 USB CABLES . Condition is Seller refurbished. Shipped with USPS Priority Mail. Manufacturer: Samsung IT. Comfortable to the touch and light in your hands, the Tab A 7.0" is easy to take anywhere. With our dynamic pricing model, our prices are always competitive. Item color: Black. 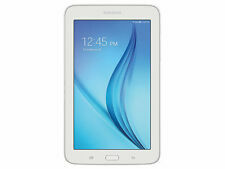 Samsung Galaxy Tab 2 SCH-915 8GB, Wi-Fi 4G (Verizon), 10.1in - Gray. These devices are in good condition. It is fully functional. This device work with any Wifi and will work with Verizon network. Up for sale is a Black Hisense Sero 7 Pro M470BSA Tablet - Parts or Repair. Unit is good condition. Powers and works as shown. Don't know the pin. Trending at $32.98eBay determines this price through a machine learned model of the product's sale prices within the last 90 days. 8GB, Wi-Fi, 7in - White. Samsung Galaxy Tab E Lite SM-T113. No other accessories included. Put the power of a PC in the palm of your hand with the Samsung Galaxy Tab E 9.6" 8GB Sprint Unlocked Tablet. With 1.3 Ghz Quadcore processor, this tablet has the power to handle just about any job. This table is in good working condition with minor wear, just couldn't reset it factory default not sure why. Brand XGODY MPN 9-T901-HD-2-US EAN 6971244532104 Model T901 Type Tablet Operating System Android 5.0.X Lollipop Screen Size 9in. Storage Capacity 8GB Internet Connectivity Wi-Fi Hardware Connectivity Bluetooth Resolution 1024 x 600 Features Built-In Front Camera Processor Quad Core RAM 1GB Color White UPC Does not apply BrandXGODY ModelT901 (100% NEW) Displaying Screen9" HD TFT LCD Display, 5-Point Capacitive Touch Screen Resolution1024*600(Use different Software test may a little different, if any question, please contact us first) CPUAllWinner A33 Quad Core, Up to 1.3GHz CPU Frequency120.0-1344MHz GPUMali-400 MP, Support 3D Games Memory Size-RAM1GB DDR3 Memory Size-ROM8GB (internal storage tablet storage system used some stor. Storage 8GB. Android 4.4 KitKat. 100% original and working or your money back. Good Overall condition. Scuffs on that back cover. If not, here's the deal: this is an e-ink tablet that allows you to write and work without distraction. When you write on it, it feels remarkably similar to writing on paper which is one of the most wonderful features of this device! Scratched screen and back cover. Android 7.0. Also subject to change especially during peak periods. Make: Samsung. Check with the manufacturer for more warranty information. UPC: 887276006468. Model: SCH-I915TSAVZW. Read your favorite book or magazine, check your email, listen to music, watch movies on the go and much more with an 8 GB tablet with a fast GHz processor. You can also keep in touch with your friends and family on social networks as this device gives you easy access to the Internet, without lugging around your laptop. Many of these devices also have HD cameras so you can take photos and video conference as well. A tablet is a portable PC that is smaller than a laptop but bigger than a smartphone. These devices may operate on the same systems as your laptop but many operate on an Android or iOS system. Typically, any input is done on the screen of your tablet, but you may also get a wireless or Bluetooth keyboard. You will also typically find a slot for a memory card if you need more than 8 GB of storage space. What screen sizes does a tablet come in? What kinds of apps are available for a tablet? Depending on which operating system you have, be it iOS or Android, you will usually have access to that system's app store. The exception to this is the Kindle Fire, which has its own app store despite being an Android Tablet. This gives you access to thousands of applications to extend the functionality of your device. You can find apps for games, business, education, health and fitness, and much more, regardless of platform. Can an 8 GB tablet replace a laptop? Whether or not your portable device can replace your laptop depends on the kind of tasks you do on your laptop. However, in many cases, the answer is yes. Many tablets, like the Apple iPad and the Samsung Galaxy Tab A, are compatible with an external keyboard. This eliminates the need for the touch keyboard you get by default. There's also no need for a mouse since you can just touch the screen to do many of the same things a mouse would. How do you connect to the Internet with a tablet? Both Apple and Android tablets have multiple options for data connectivity. Most often, you will connect through Wi-Fi. If the tablet has the feature, and you have the appropriate data plan with your carrier, you will also be able to connect to 3G or 4G networks with your device, regardless of whether or not it uses an Android operating system.